His name was Vince. By day he worked as a mild mannered bookkeeper for the infamous Chicago Stockyards — those that fueled the meat packing industry and gave us the name “Hog Butcher To The World.” Vince, however, liked to reassure people he worked “Nowhere near the slaughter houses.” But most of the time he figured it was best to not mention his place of employment at all. Especially in polite conversation, when he hoped to meet girls. Which was his exact intention one spring evening in 1939 when he cruised out to the Oh Henry Ballroom. A fan of the big bands, Vince loved nothing more than to patronize Chicago’s many dance halls, tap a toe, and if he was lucky, get a pretty girl to dance with him. And so, nothing was so very strange about that one Saturday night when a restless Vince slicked his hair with Bryl Cream, put on his best double breasted suit, and headed out to his favorite jitterbugging joint. The Oh Henry Ballroom was located in the suburb of Justice, Illinois, just southwest of Chicago on Archer Avenue. Vince spent a while grooving to the music and drinking Cuba Libres (rum and cokes) before he spotted one of the most beautiful girls he had ever seen. She was wispy and ethereal, what Vince would call “a real looker,” a blue eyed blonde dressed in a white ball gown and fancy silver dancing shoes. The girl agreed. The couple danced to a few loud, fast numbers. When the band took a break, Vince began a conversation. He found out her name was Mary and she lived in Brighton Park on Chicago’s south side, somewhere near south Damon Avenue. Vince was from the same neighborhood. The band played a slow, romantic ballad and the couple danced cheek to cheek. It was then that Vince noticed that Mary’s hands were cold and her skin brittle. Much colder and more brittle than they should have been, for Mary could not have been more than twenty or twenty one years old. Mary smiled. The couple spent the rest of the night dancing together and when the ballroom closed, Vince offered her a ride home. Mary gave Vince her exact address on south Damon. It was a straight shot down Archer Avenue, not a bit out of his way. However, on the ride home something strange happened. Vince was driving down Archer when they passed Resurrection Cemetery, the graveyard of Chicago’s Polish community. Mary insisted that Vince stop the car there. Vince was baffled, but, not wanting to upset her, he complied. Mary opened the door, and stepped out of the car. She looked at Vince, her eerie ice blue eyes piercing. With that, she turned and walked up to the cemetery gates. She put one hand upon the iron chain that bound the gates together. She then disappeared. At this point the dumbfounded Vince began to wonder if someone had slipped a mickey into his Cuba Libres. He was terrified, but determined to solve this mystery. Not only was there the weirdness of her disappearing, but since she had danced with him all evening, Vince had hopes of beginning a relationship with this lovely girl. Vince spent the rest of the night driving his Chevy up and down Archer Avenue, looking for a blond girl in a white dress. 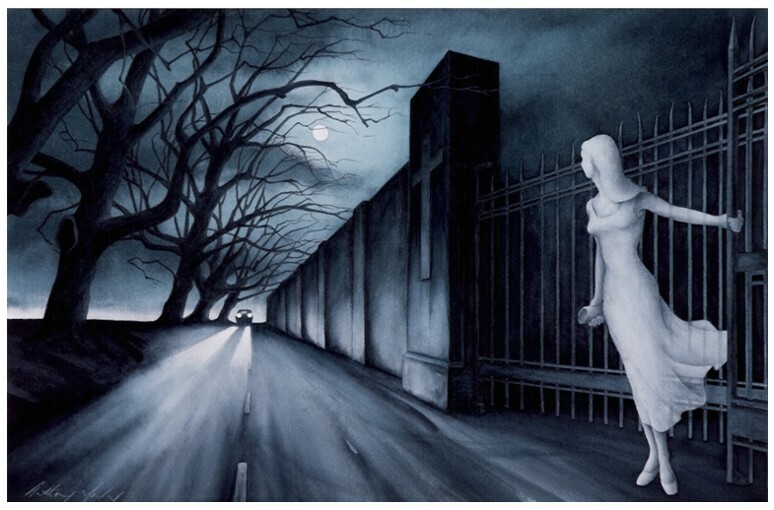 He drove until dawn, and then, when the cemetery gates opened, he entered. There, among the cement angels and monuments engraved with a variety of old world names like Barankowski, Ignasiak and Janulewicz, he explored. The morning sun reddened his sleepless eyes. The Bryl Cream of the night before had lost its effect and Vince wandered, hair falling on his face, clothes disheveled and stubble of a beard now sprouting on his cheeks. There was no sign of Mary. Vince decided to drive to the address Mary had given him. He drove to south Damon Avenue and parked the car. The street was a chain of near identical brick bungalows separated by narrow concrete gangways. Only the porch and lawn decorations differentiated the houses – American flags, statues of the Virgin Mary, velvet portraits of an all seeing Jesus whose eyes seemed to follow him as he walked up the street. Finally he came to Mary’s “house”. He rang the doorbell. The woman who answered looked (as you may have guessed) like an older version of Mary. Her mother! That, of course made perfect sense. Vince would inquire after the daughter, who no doubt had somehow made it home by now. “Is Mary home?” Vince asked. The woman stood silent for a few moments, then a look of fresh grief spread across her face. “Mary doesn’t live her anymore,” she said. “I knew Mary in high school,” he said. Vince claimed he had been Mary’s friend, but lost touch with her when he went to attend college downstate. He said he had only recently moved back to Chicago, and sought to rekindle their friendship. Mary’s mother invited him into the house. The first thing Vince noticed was a framed photograph hanging on the wall. It was indeed the same girl he had danced with the night before. Mary’s mother went on to explain that, four years ago, Mary had gone out dancing at the Oh Henry Ballroom with a boy she had been dating. Sometime in the course of the evening, Mary had gotten into an argument with the boy. Mary stormed out of the Ballroom. Even though it was winter, she did not bother getting her coat. She wandered down Archer Avenue, dressed only in her gossamer white ball gown and silver slippers. It was then she was struck by a hit and run driver and instantly killed. Mary’s family, who were of Polish descent, had her buried in Resurrection Cemetery. The corpse was dressed in her white ball gown and silver slippers. ** NOTE: There are many similar stories of Resurrection Mary that have circulated over the years. Several people have claimed to see “a woman in a white gown” hitchhiking near Archer Avenue. Some have even claimed to pick her up. 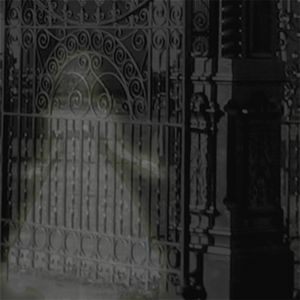 She inevitably pulls the same stunt Vince witnessed; asking to be let off near the cemetery, upon which she touches the gates and disappears. I chose to relate Vince’s story because it seemed to have the most character. Vince was a patron of Chet’s Melody Lounge which is located across the street from Resurrection Cemetery. According to patrons and bartenders, Vince told his story in the Melody Lounge for fifty years until his death sometime in the 1990’s. Reportedly, he told it in intimate detail and each time, looked as if he had, indeed, seen a ghost! The bartenders at the Melody Lounge began a tradition which they keep to this day. Every Sunday, they mix a Bloody Mary for Resurrection Mary. The set the drink on the edge of the bar in hopes that Mary might show up and drink it. So far, no luck. Vince never returned to the Oh Henry Ballroom. The place was later renamed The Willowbrook Ballroom, and remained open as a dance and banquet facility until it was destroyed by a fire in 2016. For the record, I have two grandparents and a few other relatives buried in Resurrection Cemetery. I have also been dancing at the Willowbrook Ballroom. However, on no occasion have I seen Mary, not near the ballroom, not on Archer Avenue, nor in the cemetery.